Artist inspiration and artist influences. 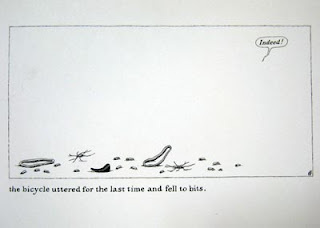 No biographies, dates or scholarly research here - this is a personal response to the work of Edward Gorey by Australian artist Fiona Morgan. It was an enjoyably sunny day some 10 years or more ago when I was being a tourist and wandering the streets of Palo Alto, California. I moseyed into the invitingly quirky looking Bell's Books and there discovered a stack or two of very curious books. One was, 'The Epiplectic Bicycle'. 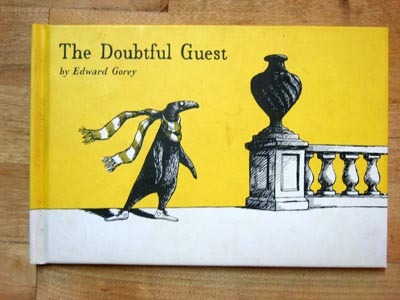 Another, 'The Doubtful Guest'. There were others. 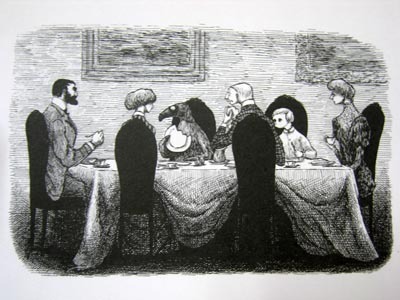 All were written and illustrated in a most uncommon style by the rather talented Edward Gorey. I was delighted. These very little books appealed instantly to my sense of the surreal. Such amusing absurdity. Such inventiveness. Such a consistently high standard. My admiration was immediate. Stories from not very many words whatsoever. Sometimes with rhymes. 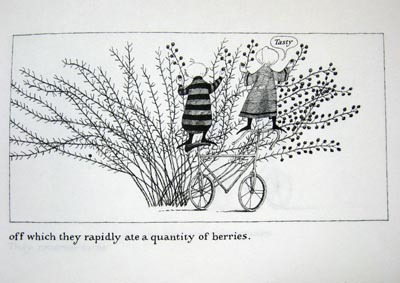 Often with antiques of language. Always with pictures. What fun. All from an artist who completely owns his own style. Ah the simplicity of pen and ink. I appreciate the stylistic intersection of cartooning and 18th century etching. Clever, that. It continues! All the stories are set in Victorian/Edwardian times. It's part of the style. It's woven into the gloom with the gothic overtones. From the fancy dress, the tureens and fountains, gramaphones and elaborate wallpaper. As well as the antedeluvian linguistics. Despite the tales being gruesome, perplexing and strange, I find they are also pervaded by a sense of calm and gentleness. How is this possible? More admiration. There are many humourous children's books which I enjoy and sometimes collect for their pictures. 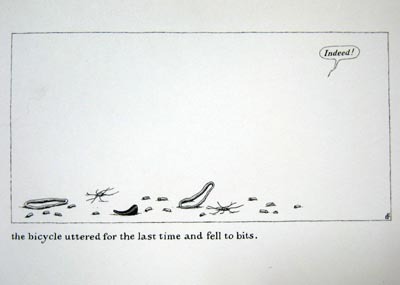 Occasionally there are kid's books worth collecting for the witty exchange between their words and pictures. 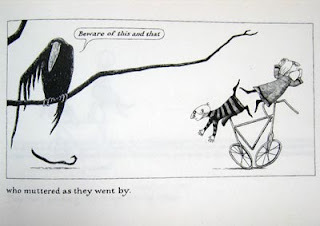 Dr Xargle's Book of Earth Hounds is a particular favourite. However I find it rare to encounter the level of intelligent play that all Gorey's books contain. It probably helps that his books were not actually written for kids. I imagine gripping the minds of tiny children and wittily amusing intelligent adults all at the same time is quite a tall order. 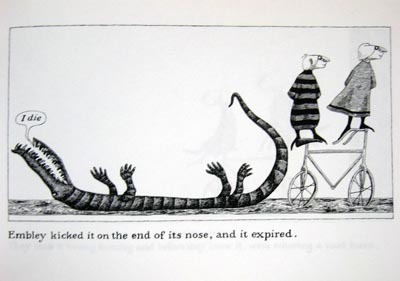 Think of Gorey's books more as playful stories for adults. In fact, he is considered to be an author of the literary nonsense persuasion. 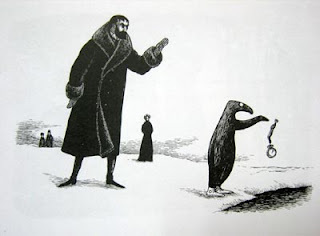 I now know that I have a taste for this 'literary nonsense'. Quite a taste. Think Lewis Carrol and Dr Seuss. I am certain this influence is going to rise to the surface in a big way in the future.